I did some research before we left and found Stone Mountain on many of the Top Things To Do In Atlanta lists. 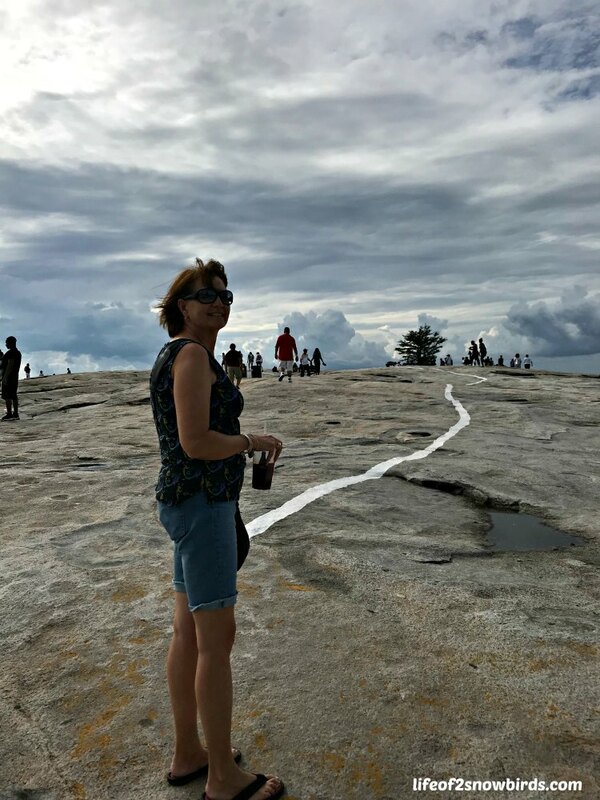 I also found out that Stone Mountain was a monadnock which is an "isolated rock hill, knob, ridge or small mountain that rises abruptly from a gently sloping or virtually level plain." On this mountain is an enormous carving which is really impressive, but unfortunately, controversial at the same time. It depicts Confederate figures Jefferson Davis, Robert E. Lee and Stonewall Jackson on their horses. 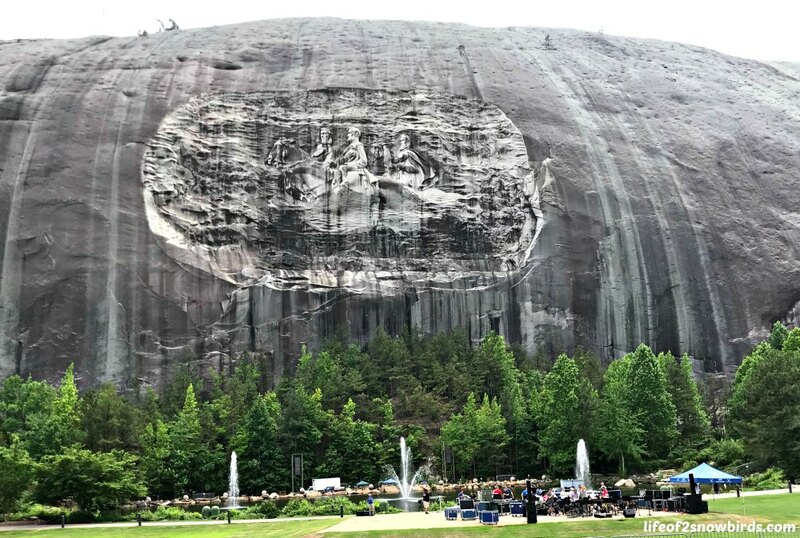 We chose not to think too much about the people on the wall and more about the people who carved it, the largest sculpture of it's kind in the world. It was interesting to find out that the first person to work on the carving was Gutzon Borglum. He abandoned the project and later went on to begin Mount Rushmore. It took the talents of two other men and many years to finally finish this project. It really is an amazing sculpture. Since we were going to get to Atlanta late in the afternoon on Sunday that didn't leave much time for sightseeing. 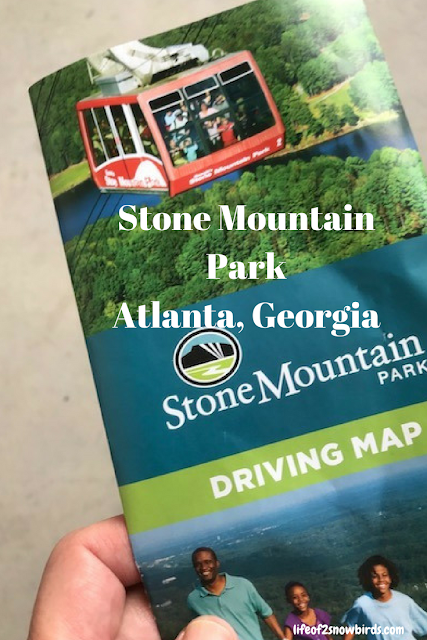 We decided that we would spend our first day in Georgia just at Stone Mountain. There is an amusement park here and they were having a Memorial Day light festival in the evening so there was plenty to do to keep us entertained for the rest of the day. We got the full park ticket that got us admittance to all the rides (except Ride the Ducks) and entertainment ($31.95) We also paid an extra $3.00 per ticket which got us dinner and endless fountain drinks. Of course dinner was the usual amusement park fare but we thought it was a great deal and we wouldn't have to leave the park to go find dinner and then come back. You can only get this deal if you order tickets online. Right now there is a great sale going on that ends July 18th. They are offering their All Attraction Pass for only $22.95! The first thing we did was check the schedule of the two shows. One was a 4D movie and the other was a one man show. We had a few minutes to get to the one man show after we got our reusable cup and our first drink of the day. 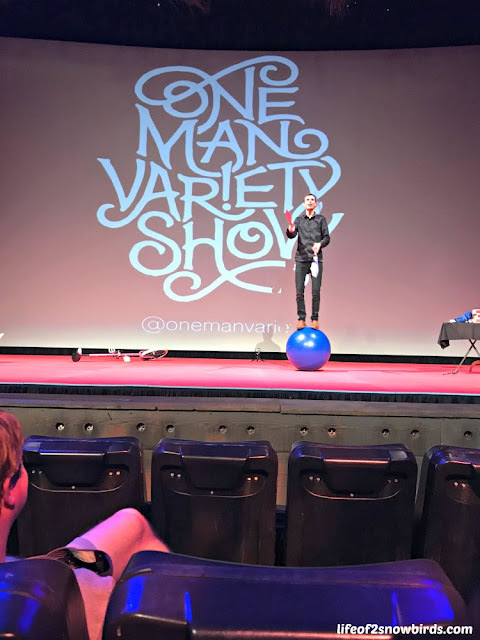 The One Man was a juggler but added different elements and used different props to juggle that we had never seen before. We loved the rectangular blocks he juggled with. When he tossed them they almost looked like they were floating in air. 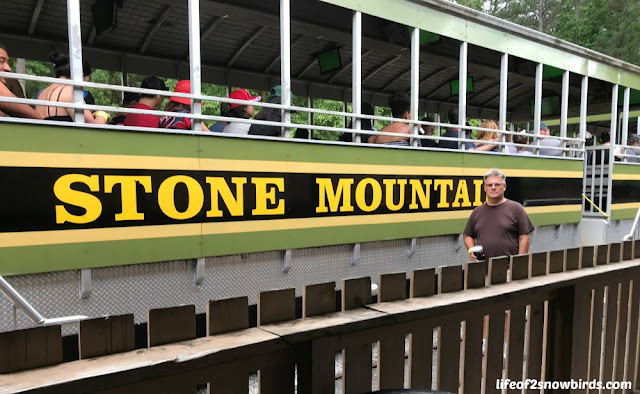 Next up, we boarded the Stone Mountain Scenic Railroad that took us on a leisurely ride around the perimeter of the mountain. We rode past the carving and got a very good view of it. We were able to take a great picture of it as the train went slowly by. After the train ride around the mountain, it was time to go up the mountain. Our all inclusive ticket included the Skyride aerial tram ride up to the top of the mountain. If we didn't have the ticket we could have climbed up. We have never been on top of a quartz monzonite monadock before. It really is a gigantic rock and it felt like I was walking on the moon with all of it's small craters (rock pools). There were a couple of trees up there that found a small patch of dirt, in the crevices of the rock, to grow in. They looked out of place to me growing out of the rock but I was very impressed with their determination to grow when the odds were against them. We had a terrific view of downtown Atlanta from the top of this mountain. We walked around the mountaintop to see all the different views and take lots of pictures. Near the Skyride was Memorial Hall. This building contained a museum and two movie theaters. 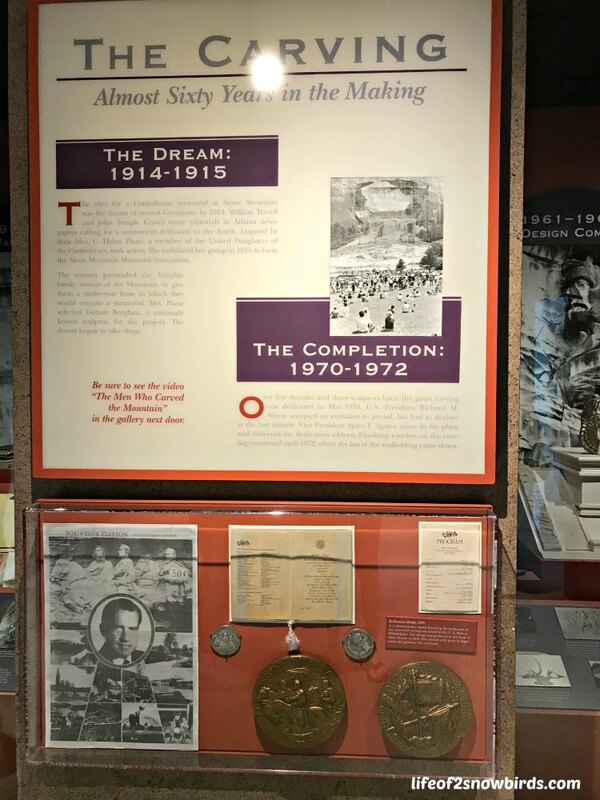 The first thing we came to as we entered was rows and rows of pictures of heroes that lost their lives so that we could live our lives freely. There were notes and things taped to some of these photos from family of friends of these brave people. It was a sad but wonderful memorial display. After we spent some time here we went to find the museum. We learned all about the artifacts that the museum had from civilizations that have lived on this mountain. Some items dated back 12,000 years. We learned about how the granite from this mountain helped build the local economy. And we learned all about how the carving came to be when we watched the 11 minute film in one of the theaters. In the early evening, we got our folding chairs and set them up on the lawn with hundreds of other people. 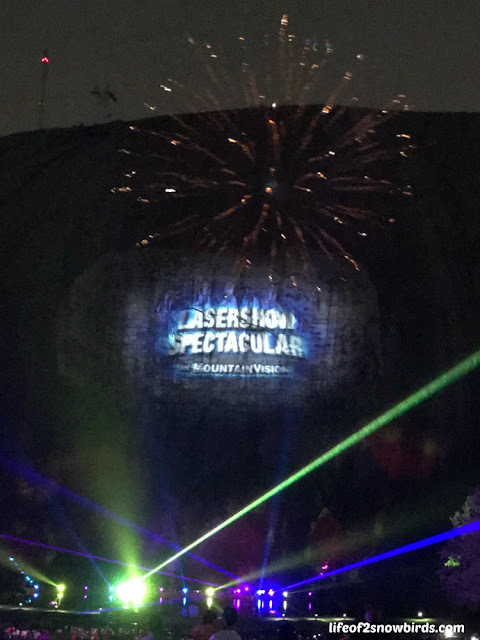 We ate our chicken strips and grilled chicken sandwich dinners and enjoyed the music of the Air National Guard Band of the South while we waited for the laser show. 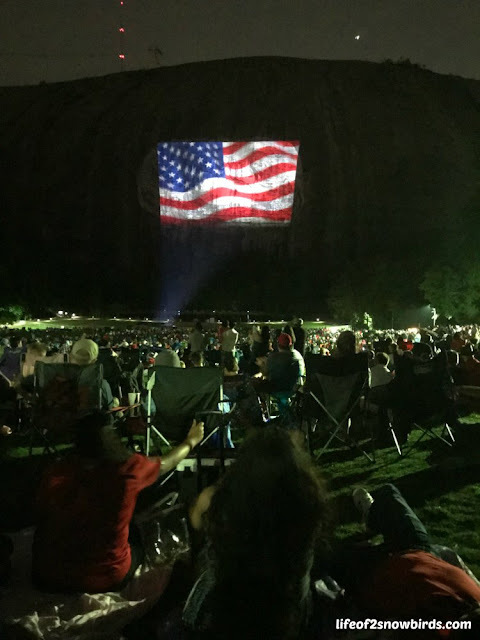 Because it was Memorial Day, there were plenty of patriotic symbols in lights and we had a chance to honor vets and current heroes with a standing ovation and moment of silence. After the light show which lasted almost an hour, there was a fireworks display. We don't know how long they went on for because it started to rain for a second time, and it was coming down harder than before. We decided to leave along with two thirds of the spectators. There were diehards there that were sticking it out to the end. 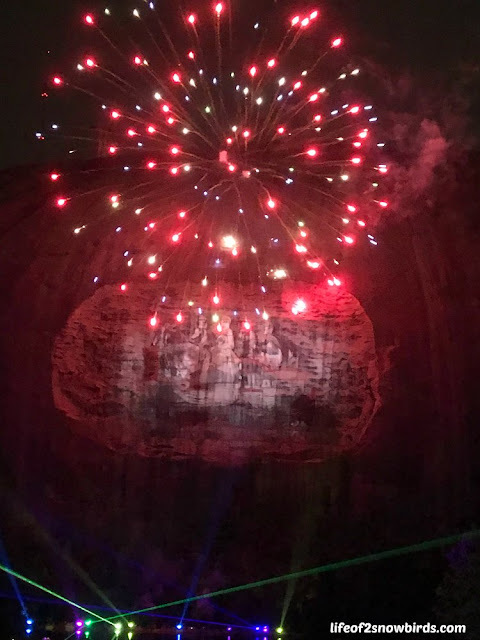 We had a nice, relaxing time at Stone Mountain Park. There was so much to do here and didn't even get a chance to do it all. We missed the Antebellum Plantation with the historic manorhouses and the petting farm. There is also an area called Camp Highland Outpost with many outdoor challenges, like rock walls, for lots of family fun. And if we were 50 years younger, we would have enjoyed the splash area and dinosaur play room also. I am putting this park on our "Must See With Grandkids" list! Everyone I know has been there. I want to go too. Thanks for sharing. It was lots of fun for all ages. I hope you get a chance to go one day. Thanks for stopping by! Looks like another great adventure. Thanks for sharing on To Grandma's House We Go! It was! 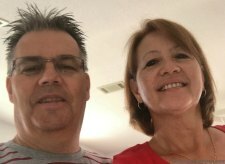 Thanks for checking out this post. Sounds like a lovely break! We always enjoy Georgia, but I've been mostly in Savannah. I was so taken with that carved mountain. I always thought Mount Rushmore was the only one. Thank you so much for sharing, and for being a part of the Hearth and Soul Link Party! Hi April. Looked like you had a very enjoyable vacation recently. Do you have any posts on Savannah? I will be going soon and would love to read them.